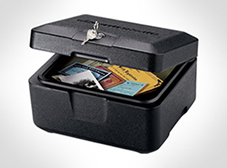 The SentrySafe Fire Chest is a great item to secure your home and office belongings. It is UL classified with 1/2 hour proven fire protection and ETL verified 1/2 hour fire protection for CDs, DVDs, USB drives and memory sticks up to 1550°F. The Fire Security Box comes with a privacy key lock.